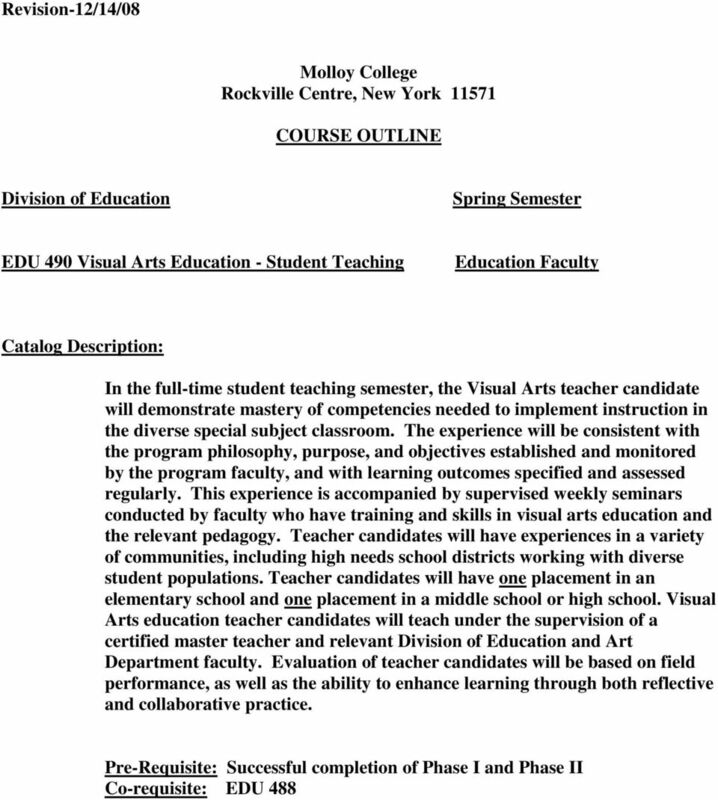 Download "Molloy College Rockville Centre, New York 11571 COURSE OUTLINE. EDU 490 Visual Arts Education - Student Teaching"
2 Course Objectives Teacher candidates will: Demonstrate knowledge and understanding of subject matter by planning and implementing content rich learning experiences. Demonstrate knowledge of student development by designing grade and age appropriate learning experiences. Demonstrate knowledge of differences in how students learn by creating differentiated learning experiences containing tiered objectives, learning activities, and evaluation criteria. Demonstrate the ability to employ a variety of instructional strategies and techniques that will encourage each student to develop critical thinking and problem-solving skills by refining questioning skills and techniques. Demonstrate the ability to integrate technology into classroom instruction. Demonstrate the ability to create a learning environment that encourages active and engaged learning for diverse students as indicated by student interest and enthusiasm. Demonstrate the ability to design and implement a variety of formal and informal assessment strategies to evaluate students progress by developing and using numerous forms of alternative assessments. Demonstrate reflective teaching skills that will enable the teacher candidate to evaluate the impact of his/her actions on students, parents, and other professionals by developing and maintaining a teaching journal. 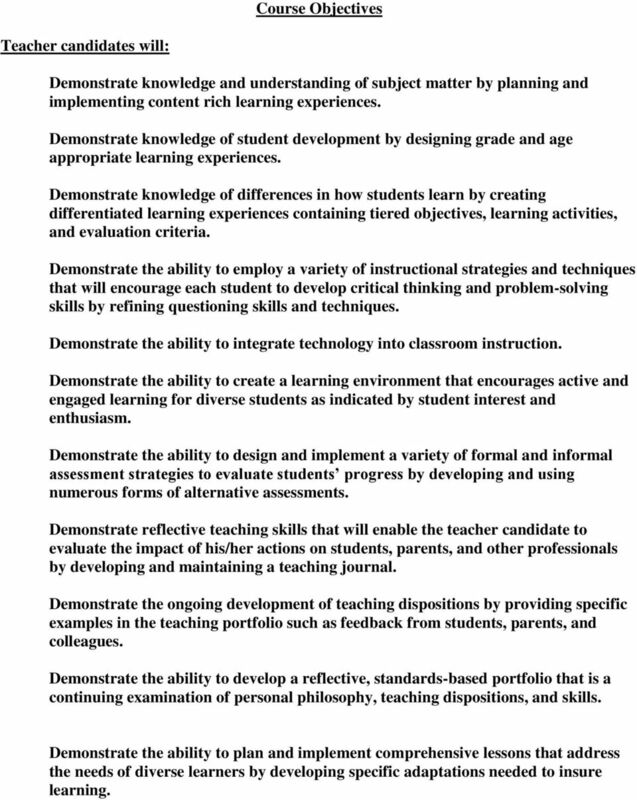 Demonstrate the ongoing development of teaching dispositions by providing specific examples in the teaching portfolio such as feedback from students, parents, and colleagues. Demonstrate the ability to develop a reflective, standards-based portfolio that is a continuing examination of personal philosophy, teaching dispositions, and skills. Demonstrate the ability to plan and implement comprehensive lessons that address the needs of diverse learners by developing specific adaptations needed to insure learning. 3 Demonstrate the ability to work with family, school colleagues, and the community to support student learning by participating in parent conferences, PTA meetings, faculty meetings, and community functions. 1. 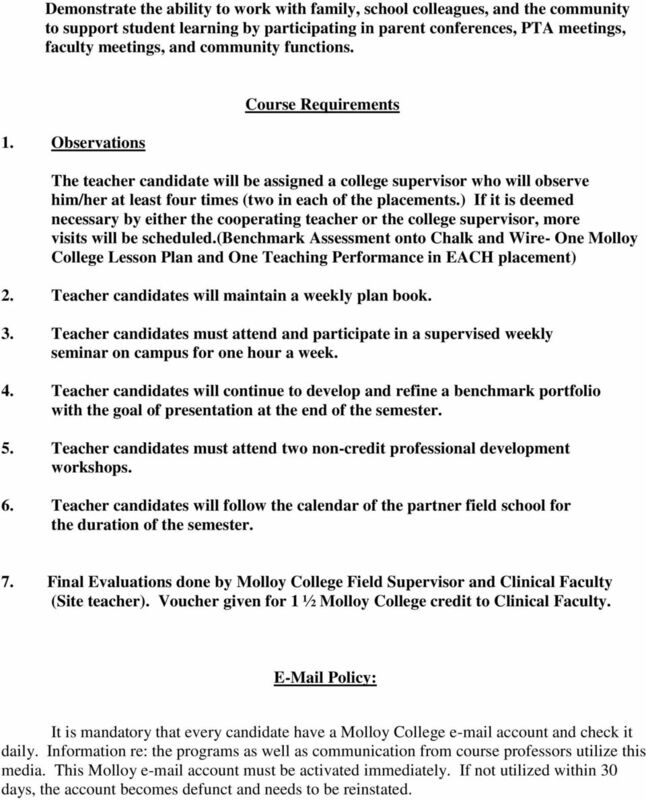 Observations Course Requirements The teacher candidate will be assigned a college supervisor who will observe him/her at least four times (two in each of the placements.) If it is deemed necessary by either the cooperating teacher or the college supervisor, more visits will be scheduled. (benchmark Assessment onto Chalk and Wire- One Molloy College Lesson Plan and One Teaching Performance in EACH placement) 2. Teacher candidates will maintain a weekly plan book. 3. Teacher candidates must attend and participate in a supervised weekly seminar on campus for one hour a week. 4. Teacher candidates will continue to develop and refine a benchmark portfolio with the goal of presentation at the end of the semester. 5. 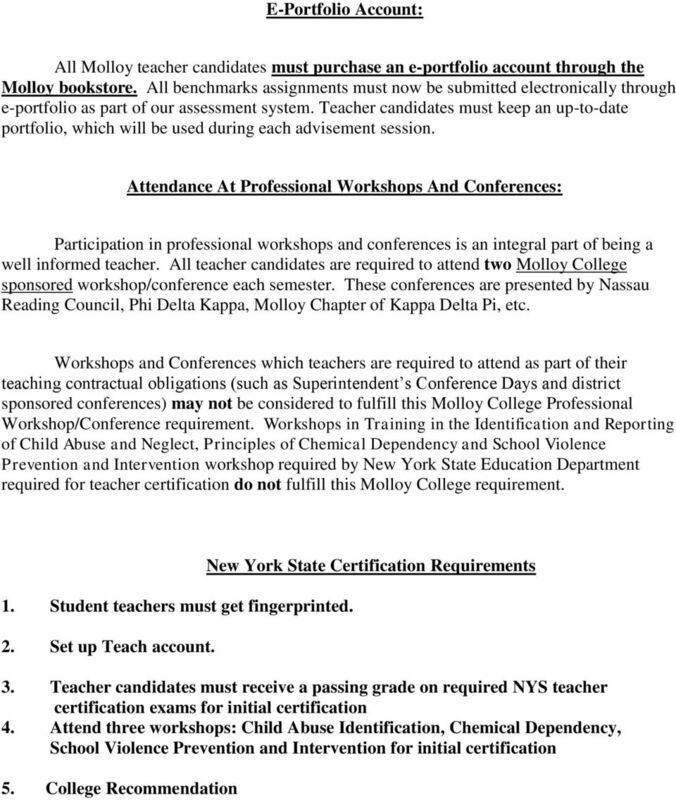 Teacher candidates must attend two non-credit professional development workshops. 6. Teacher candidates will follow the calendar of the partner field school for the duration of the semester. 7. Final Evaluations done by Molloy College Field Supervisor and Clinical Faculty (Site teacher). Voucher given for 1 ½ Molloy College credit to Clinical Faculty. Policy: It is mandatory that every candidate have a Molloy College account and check it daily. Information re: the programs as well as communication from course professors utilize this media. This Molloy account must be activated immediately. If not utilized within 30 days, the account becomes defunct and needs to be reinstated. TEACHER CERTIFICATION AT FONTBONNE Applicable to all departments offering a teacher certification option The following provides an overview of programs leading to teacher certification at Fontbonne University. Supervised Student Teaching Experience for All Education Majors Additional requirements may be expected in each individual education program. Please see your University Supervisor for more information. Education. Hanson, J. Roberts, Williams.